 Why buy the DVD when you can watch it instantly online for less money? If you love Adventure Riding, then you probably love watching adventure motorcycle movies as well. There’s no better way to get inspired for your next ride than to watch an adventure motorcycle documentary filmed in an exotic land. There are a lot of great DVD titles out there and the cost of purchasing them can really add up. Typically, you only watch them once or twice and then they start to collect dust on your shelf. Over the years, those adventure motorcycle movies you’ve been collecting can take up a lot of space. As more video content moves into online video services, DVDs are on their way to becoming obsolete. A better way to get your adventure motorcycle movie fix is to use Amazon’s Instant Video service. Amazon Instant Video allows you to enjoy many popular adventure motorcycle movies online at a fraction of the cost of buying the DVD version. For example, the Backcountry Discovery Route documentary DVDs cost $24.95 each plus shipping and handling. However, you could purchase the digital version of the same BDR DVD for $19.95 or rent it for 7-days for just $1.99. If you have an internet enabled TV that runs the Amazon Instant Video service, you can watch adventure motorcycle movies in your living room just like any other DVD. You can also watch them on your computer, tablet or mobile phone. A nice feature Amazon offers is the ability to download your movies to a tablet or mobile phone for offline viewing. This allows you to watch them on an airplane or anywhere that an internet connection is unavailable. Some popular adventure motorcycle movies available are Ziggy Marley’s Africa Road Trip, Long Way Round and Long Way Down, Globe Riders, Backcountry Discovery Routes and Rawhyde Off-Road Training. Expect the number of titles to grow over time. 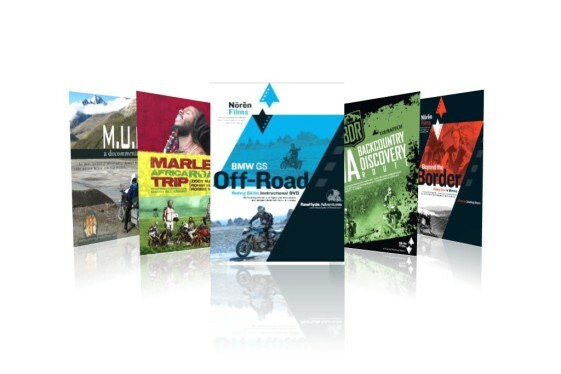 You can see the current list of Adventure Motorcycle specific titles below.  Ewan and Charley’s Long-Awaited ‘Long Way Up’ Set for 2019? The Long Way Round and Long Way Down series are on Netflix too. Great info guys!! Especially nice is that no subscription is needed to watch them and the option to download and watch offline is awesome! I gave up after the third episode of Long Way Round. It was focusing more on sightseeing than riding. And when riding, Charlie was always trying to show off. It just got old really fast.